I have been wanting some canisters and a container to hold my jewelry for A LONG TIME. I finally got the opportunity to review these amazing containers from Snapware. The company generously sent me a set of 5 canisters and a snap and stack container. I love them!! They are great quality and very affordable. This 10 piece set only costs $24.99! The giveaway will be for this same set of Snapware containers that I was given for review (a $32 value!!). The giveaway is open until Midnight on Thursday September 30th. Winner will be chosen on Friday October 1st using Random.org. Visit the Snapware WEBSITE and let me know what your favorite product that they sell is! -Join the Snapware family (3 entries). -Let me know your best organization tips (1 entry). My favorite is the snap and stack 4 layer. My best tip is labels lots of labels. #1 I Joined the Snapware family. #2 I Joined the Snapware family. #3 I Joined the Snapware family. I entered your Oak Ridge Candle Giveaway. Love the 2 layer cupcake/cookier holder..especialy since mine from Crate & Barrel is broken after only 1.5 years. 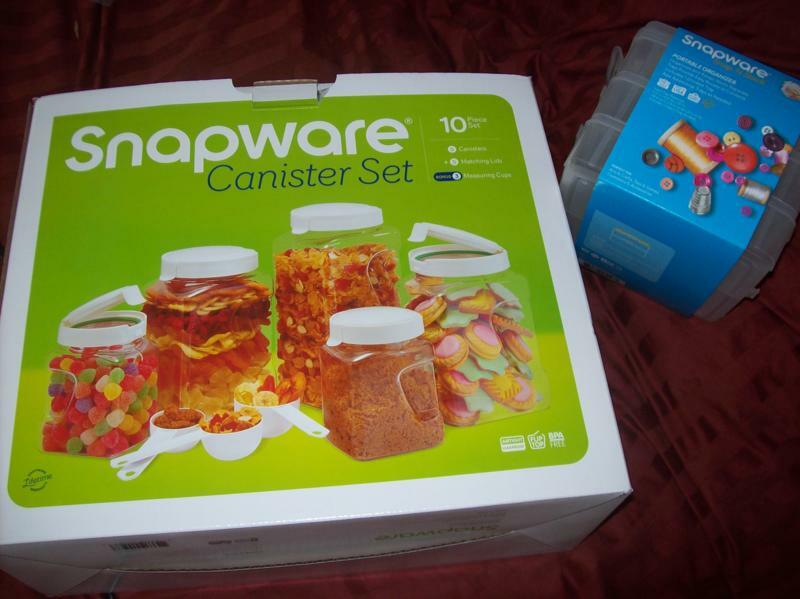 I did join the snapware family..I have some of their products and love them. My best organizational tip..hmm...I like to use plastic boxes for storage everywhere. I have a plastic box with all the baking stuff..such as chocolate chips and cupcake holders in one in the pantry. I have another for icing/food coloring, sprinkles, etc. It really helps keep the pantry organized. I use them in the master closet for items such as socks (we don't use dressers and don't have enough drawers in the closet for some things). I even use them in the closet for things such as extra toothpaste and toothbrushes. I'm also entered into the lipbalm giveaway. Every time we have a family bbq, I'm asked to make and bring deviled eggs. My favorite product on the site would be the 2 Layer Eggtainer! Thanks! 1. 1 joined the Snapware family. 2. 1 joined the Snapware family. 3. 1 joined the Snapware family. I use different sized baskets to organize almost everything in my home. Would love to have the cup cake container. I love the 17.1 Cup Pet Treat Canister! My best organization tip? Well, I love to label things. Kind of weird, but everything has a 'special' spot! I'd like the Snap N Stack Medium 2 layer! I really like the canisters, one can never have too much storage! To help me stay organized, I have a binder for each child and a family binder. I keep all phone #s, school info, activity info, etc. in these and it works well. my favorite organizational tip is to look at things with fresh eyes occasionally. you will see it in a new light, and find a better way to organize and sort things. I do this all the time and always find a better way to sort things. I joined the snapware family! I entered Giveaway: Oh Wow! Lip Balm. I entered Giveaway: $60 Bridgewater Candles. I would love the cupcake box. I love the pet food containers! Those look awesome! The cupcake carrier is my favorite.